Casa Colibri is a 5,000 sq. ft. luxury house located within the very up-scale and very private gated community called 'Samara Reefs'. Of the 7 houses in Samara Reefs houses, Casa Colibri is one of the largest and is owned by a Canadian couple; it was designed with comfort, elegance, and entertaining in mind. It is the perfect house for an extended family or for 3 couples looking for a spacious house close to town where all the bedrooms have stunning ocean views. There is a fully-outfitted gourmet kitchen, a 40-foot private saltwater infinity-edge swimming pool, an elegant outdoor dining room; on the pool deck is a high-end outdoor BBQ grill/outdoor kitchen. This house is completely surrounded by beautiful gardens and mature native trees that attract families of monkeys, parakeets, hummingbirds, and many species of tropical songbirds. Throughout the house, natural materials such as local hardwood, Colombian limestone floors, and bamboo accentuate the relaxed tropical ambiance. Situated among mature jungle trees and backing onto the Werner-Sauter ecological nature preserve, the house has jungle at the front and back of the house. From the poolside mid-day - and in the late afternoon from the front door - it is not unusual to spot a troop of howler monkeys in the trees. Built in 2008, the 7 Samara Reefs houses are all situated along a 7-acre ridge that is150 feet above sea level. It has a picture-book ocean view: it overlooks the horseshoe-shaped bay of Playa Samara and in the center of the bay is the tiny island called Isla Chora. Casa Colibri has awesome views from all sides, for instance, from the front door the view is of a dense green jungle, and the Werner-Sauter protected ecological reserve. The reserve is filled with huge native trees that you would expect to find in much more remote regions of the country. Because of its elevated position on ridge, Casa Colibri receives both off-shore and on-shore breezes, which help to keep the house feeling fresh and cool. Its location allows not only stunning ocean views, but also picturesque sunrises, AND incredibly beautiful sunsets. Unlike other high-end neighbourhoods in Samara or Nosara, Samara Reefs is accessed by paved roads the entire way. It is located within easy walking distance to Samara Beach (15 mins) and is close to Samara's many restaurants and bars. A car is not absolutely necessary, as taxis are available. The town of Samara is very friendly, offering vacationers a huge choice of excellent restaurants (including Locanda, Mama Gui, and Gusto's). For a small town, there are surprisingly large number of good restaurants, dozens of activities (including surfing, diving, fishing, kayaking, zip-lining, hiking, ATV's, horseback riding, boogie boarding, gyrocopters, etc), and all the amenities you'd expect in a larger town: 2 banks, 6 grocery stores, several souvenir boutiques, a dentist, an English-speaking doctor, several tour companies, and the very helpful Samara Information Center - which is like having your own personal concierge. - 1 Guest bedroom with single bed (main level) appropriate for a child or single adult. 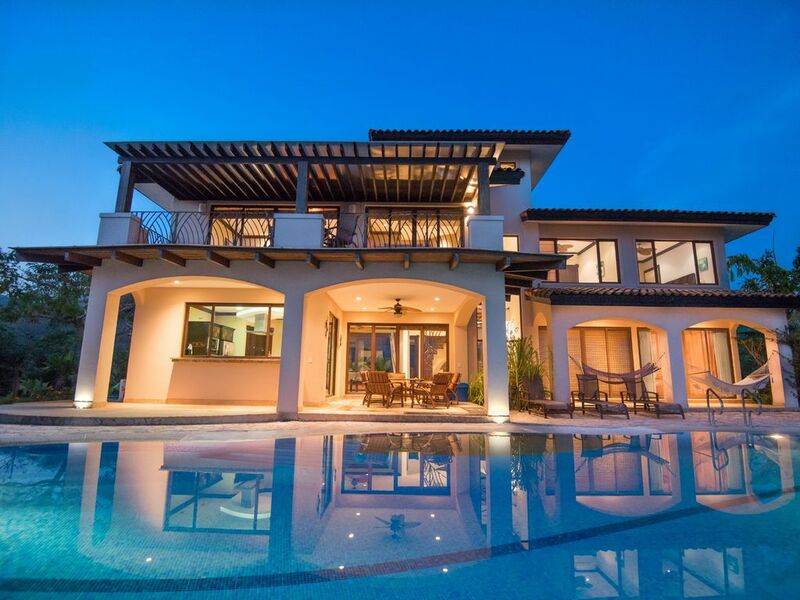 Casa Colibri was built in 2008 by Architect Karin Nagel and interior designer Julietta Jurado; the house is elegantly furnished, extremely functional, and built to high-end US standards. From the huge floor-to-ceiling windows, the kitchen cabinets, all of the carved hardwood doors and the staircase, every feature of this house is custom-made. Important details like large windows with high-quality window screens and secure locks ensure maximum comfort. One of its best design features of the house is how the rooms flow seamlessly from one to another. Large glass patio doors off the living room open up fully and connect all the main rooms into one large open-aired living space: the kitchen, dining room, and living room, the pool, and the pool deck. Chefs will appreciate the well-designed kitchen, the stainless steel appliances, gas stove, large countertops, and high quality knives and pans. The kitchen work space is bright and inviting, with windows on all sides; it is large enough to accommodate multiple chefs. The 4-person sit-up bar is very handy extra seating. A unique feature is the large walk-in kitchen pantry; filled with wooden shelves, this room is air-conditioned and humidity-controlled and is the perfect area to store dry-goods, wine, beer, and fruit. The upstairs master bedroom is very large 650 sq.ft., and takes up one-third of the upper floor. There is a king-size bed, solid almond-wood floors, remote control A/C, a Tommy Bahamas ceiling fan, 2 reading lamps, tons of storage, a walk-in closet, a very large bathroom, beautiful frosted glass doors, and a large ocean-front sundeck. You can open up the curtains and enjoy huge panoramic ocean views - right from your bed! The sundeck runs half the length of the top floor and, being on the 2nd floor, you get a spectacular view of the entire Samara Bay AND gorgeous sunrises. A table with 2 chairs is perfectly situated for you to enjoy morning coffee on your deck. From the en-suite bathroom there are 3 view windows; there is even a window in the walk-in shower. From the full-size bathtub, enjoy views of the forest reserve. Beside the bedroom is an Executive Office - the perfect, quiet room to set up your computer and work 'from home'. Up on this bedroom/office sundeck is where we recommend enjoying your first cup of coffee and doing some birdwatching. The comfy chairs are perfect for relaxing in for enjoying the sunrise and morning sunshine. In the morning and throughout the day, you will see large flocks of parakeets, butterflies, and every day, dozens of hummingbirds (colibris) dart in and out of the pink-flowered trees below. In front of you the view is multi-layered: there is a dense canopy of trees, then beyond that, sandy Samara Beach, and beyond that, the island called Isla Chora - the view that Samara is famous for. Because Costa Rica is so close to the equator, the sun rises at 6 am and sets at 6 pm year-round. The temperature stays warm in the evenings; there is no need to pack a sweater. Our barbecue area is perhaps the prettiest on the planet - it is located beside the swimming pool at the edge of the sundeck and overlooks the canopy below and is so perfect that it has inspired the phrase "Barbecue Envy" from recent guests. The house has 2 pool-side hammocks, 3 lounge chairs, and is large enough so that, even with 8 people, quiet corners can be found to enjoy a book or have a nap. If someone wants to watch TV without disturbing others, there is a separate air-conditioned TV room. Adjacent to the house is a unique feature - Samara Reef's amazing waterfall feature. Modeled after our favourite hotspring resort, Tabacon Resort in Arenal, there is a water fountain with water flowing along a rocky "river". The water falls down over a wall, cascading down into a "jungle pool" below. One of our favourite activities is sitting under this water and getting a great shoulder massage! It is exhilarating and ultra-relaxing. During the hottest hours of the day, do check out the shady grotto behind the waterfall. Note that the water comes on automatically each morning for only a few hours. Another unique feature of the house is our "sunset deck". This is located on the rooftop of our carport. One day we realized how wonderful the sunset view was - and the views of the surrounding back hillside. So we built some seating and put a string of twinkling lights up. Now this area is one of our favorite evening spots where we regularly enjoy wine and appetizers. By day, it's a quiet spot to do yoga. It's also a great spot for watch troops of monkeys swinging in the jungle on the nearby hillside. The tropics can be hot! But because of its situation on the hillside, there are wonderful cross-breezes that flow right through the house. Off of the ocean, cool breezes flow into the house while, at other times, the cool mountain air comes off the hillside and flows through the front door, keeping the interiors cool and fresh. But the absolute best feature of the house is the view. Whether you are inside the house, or out, you will find yourself utterly captivated by the stunningly beautiful panoramic ocean views, the rounded shoreline of Samara beach, the island of Isla Chora, and the protective reefs that appear and disappear with the tide. From the bedroom windows you will have a bird's-eye-view into the surrounding hillsides watch, kayakers heading to Isla Chora, or fishing boats headed out to sea. It is truly a magical place. My husband and I built Casa Colibri in 2008. We love the tropical sunshine and it is the perfect place escape from the cold Canadian winters. When we ourselves cannot be in Samara, we very much enjoy sharing our piece of paradise with others. If Casa Colibri is not available for your dates, do check availability at Villa Mirador (vrbo 393786) which is 2 houses away, or ask me about the availability of two other Samara Reefs houses: Casa Centenario or Driftwood House. Also, check out Casa Estiyul (vrbo 553084), our partner's house on the hillside just below Samara Reefs. Pura Vida! Casa Colibri is an easy walk to Samara Beach and a short drive to the town-center. Samara has everything you DO want and nothing you DON'T want. It is a small, friendly town with a surprising number of great restaurants, 4 excellent grocery stores, and TONS of activities including hiking, fishing, zip-lining, beach activities, surfing, kayaking, swimming, kayaking, snorkeling, etc. In the town-center there is plenty of shopping choices and amenities such as car rental, a dentist, doctor, 2 banks, and some boutique shopping. Also, it is only a 5 minute drive to Playa Carrillo, considered by many (including the Lonely Planet) to be a jewel of Costa Rica: one of the country's most beautiful and unspoiled beaches. We vacationed here with our toddlers (now in their teens) and loved the safety of Samara and the small, friendly town of Samara. Because of the shape of the beaches and the protective offshore reefs, there are no LARGE waves, making these 2 beaches some of the safest swimming beaches in the country. And both win awards for outstanding cleanliness standards. We love having 2 beaches: for body surfing and boogie boarding, we prefer the waves at Carrillo; for people-watching and surfing, Samara is unbeatable. The town of Samara is wonderful: very friendly, relaxed, and even though it is small, it has a surprising number of great restaurants! And there is a huge variety of activities available - it is truly the perfect fit for a family vacation. The locals (who call themselves Ticos) are very friendly, positive, and happy people. Samara Reefs is a very special location, incredibly beautiful. We feel it surpasses all other developments of its type on the Pacific Coast of Costa Rica. Come share our piece of paradise. The two beaches, Playa Samara and Playa Carrillo are two of Central America's BEST beaches. If you want to relax, sit in a restaurant with your feet in the sand (margarita in hand) and be just feet away from the water, then Samara is the right beach for you. Not only is the choice of restaurants great, but at several of them, you can sit comfortably in the shade watching your kids play in the sand, swim safely in the water, take surfing lessons right in front of you. When the surf lesson is over, they can join you at the restaurant. Perfect! if you like people-watching, Samara has lots of fun restaurants, cafes, bars, and has a very friendly and relaxed "vibe". Samara is made up of local Costa Ricans, Americans, Europeans, a Registered Massage School, and is home to excellent surfing so the local vibe is diverse, energetic, and LOTS of fun. Palm-lined and pristine, Carrillo has been called "THE PRETTIEST, MOST UNSPOILED BEACH IN ALL OF COSTA RICA" by Lonely Planet. A HUGE benefit of Casa Colibri is its wonderful on-site caretakers. If you need assistance or help with the house, our Administrator, Daniel Quiros, and his wife Anna live across the street in their nearby casita. They are extremely helpful and will do everything they can to make your vacation even more enjoyable. toilet, shower, Convenient bathroom on the main floor near living area. toilet, shower, This bathroom is shared by the 2 upper bedrooms. toilet, outdoor shower, There is an outdoor shower next to the pool. All 5 bathrooms are very upscale, with beautiful Colombian limestone floors, showers made of rock and tile, and all showers are all enclosed with glass doors. High-end Kohler fixtures used throughout. The Upper Master bedroom bathroom is huge - over 600 sq. ft. It has a large soaker tub, a vanity which has two above-counter sinks made of natural rock. There is a huge wall mirror plus a handy 3x make-up mirror. A walk-thru closet separates the bedroom from the bathroom area. The bathroom has 4 windows which look out across the forested hillside; there is even a window inside the shower. The toilet is completely enclosed for privacy from the rest of the bathroom. Casa Colibri is a 20-minute walk to the town center of Samara. There you will find many excellent restaurants, 4 grocery stores, a Farmer's Market, yoga, a gym, a spa, boutique shops, ATMs, etc. Completely unobstructed panoramic beach views from the pool, the pool deck and all 5 bedrooms. You see sandy Samara Beach, the off-shore reefs, and the picture-perfect island of Isla Chora. Every window has gorgeous views of the surrounding green jungle: there are parakeets, over 20 varieties of songbirds, hummingbirds, several families of howler monkeys. Casa Colibri is located 150 feet above sea level so you get fabulous 180-degree ocean views. This unique location means you get stunning sun rises in the morning and in the evening, fantastic sunsets. We are a 10-minute walk from sandy Samara Beach. From beach entrance, it's a 10 minute walk along a shaded pathway into town-center, many restaurants, bars, and amenities. All 4 bedrooms and the tv room are equipped with A/C. All rooms have high-quality overhead fans that are very quiet. High quality bed linens are provided, with minimum 300 thread count. Full-size Super Capacity dryer with multiple settings for Delicates, Towels - (Frigidaire Gallery Series) The large clothes drying rack is handy for drying delicates, etc. Bathroom towels made of 100% cotton, kitchen towels, and large assortment of beach towels are all provided. The living room has 2 comfortable sofas (made of woven banana-leaf), a round coffee table, and a cabinet full of DVDs. The TV room has a large leather sofa, an oversized chair, coffee table and A/C. Stainless Steel Frigidaire Professional Series, ice cube maker/crushed ice on the door. Located at the center of the kitchen is a high-end 6-burner European gas stove (Lentz). The overhead exhaust fan is a multi-speed, made by Kupper (Germany). There is a convection wall-oven. Stainless Steel Frigidaire Professional Series Convection wall oven. The house is stocked with basic condiments - ketchup, dijon mustard, bbq sauce, tabasco sauce, hot sauce, soya sauce, as well as salt, pepper, sugar, and a variety of spices. Fully equipped w.10+ place settings, serving platters, high quality cutlery, coffee mugs, 2 sets of glassware, 10 wine glasses, wine bucket. Large platters and serving dishes, appetizer trays, etc. The large gourmet kitchen is perfect! It has large windows on 3 sides - you see the pool and ocean view, the dining table, and the side-garden. There are 3 large granite countertops, a HUGE kitchen sink, a d/w, a handy 4-person breakfast sit-up-bar, plus a large air-conditioned pantry-room for storing food and beer. Our outdoor dining room has an absolutely stunning ocean view. The table and 8 comfy cushioned chairs are perfect for family meals, reading, playing board-games, relaxing, etc. Located near the living room, the TV room is 99% sound-proof, has A/C, ceiling fan, Sony Brava wall-mounted flatscreen TV. Room has glass sliding doors opening onto garden with small water fountain. TV has cable, lots of TV shows, plus you can watch Netflix from your account. We recommend you bring your own portable stereo system. Or your phone and speakers. Enjoy checking out our large library - there is a huge variety of novels, some bestsellers for beach-reading, as well as Costa Rican guide books, a flora and fauna guide, and a stargazing guide. Assortment of games includes scrabble, crib board, etc. We have approx. 40 DVDS, many of which are new and unopened. Beside our pool is a large grassy area & a variety of tropical plants, including lemon trees, palm trees, and exotic flowers of the ginger plant, heliconia & bird of paradise. Enjoy panoramic views from the large sundeck off the Upper Master Bdrm. Enjoy amazing sunrises AND sunsets! Four comfy chairs and table make it perfect for enjoying coffee, the surf & bird watching. Rent a kayaks from the Kayak-rental company located on the main road 2 minutes from Samara Reefs. Additional kayak rental companies are in Samara's town center. Bicycles are available for rent in Samara for $8 per day. Fishing boats & charters available in Samara. Go dolphin watching, fish for tuna & dorado close to shore, or go deep-sea fishing for marlin and sailfish. Contact the Samara Info Center for details. The huge poolside deck is the center of activity here - it adjoins the outdoor dining room, the living room, the two main-floor bedrooms, and the outdoor barbecue area. Enjoy great ocean views. Boogie boards available for rent $2/hour Surf boards free during week of surf lessons. Divers check out Freedom Dive Shop in Samara. Tennis courts available in Samara. Thirty minutes away at the beautiful Hotel Punta Islita is a 9-hole course. A great daytrip esp. when part of ARA parrot project. Private 40-ft infinity-edge salt-water pool. Great for laps, plus a shallow toe-dipping area. Features in-pool seating, lights & jets. Because it is salt-water, there is almost NO chlorine smell. We had an absolutely wonderful stay in this beautiful home. We took our four boys and stayed for nine nights. They have an age range from 25 to 10 and everyone was happy! There are plenty of activities to do in and around Samara that will satisfy all. It was wonderful to be able to enjoy the house and the private pool. Everyone had their own space if they needed a little private time. The little town of Samara is close so that everything is easily accessible. We did find the road into town to be a little risky for walking so we did drive but that was no problem at all. There are lots of charming restaurants right on the beach. We would highly recommend this home. You will not be disappointed . Do take the time to review all of the information that Mary-Ellen shares with you before you go. Her recommendations are spot on! She is hugely helpful! We loved your home...it was perfect for our family getaway. The views are out of this world and the kids loved the pool. We enjoyed walking down to the beach and exploring the town with its many restaurants and little shops. We will be back! Everything was perfect. Great stay!!! Casa Colibri is a gorgeous house with every amenity you could need for the perfect relaxing vacation. We stayed here in February and were able to experience all the beautiful parts of Samara, Costa Rica. We often dined in and enjoyed the perks of grilling, lounging by the pool and sitting outside listening to the sounds of paradise. We will absolutely choose the Samara Reefs again when visiting Samara and will for sure recommend to anyone else who is interested. Thank you! Casa Colibri is much more than the sum of its parts. Sure the house is beautiful and spacious, the location in Samara Reefs is the perfect balance between convenience and privacy, and the people involved go out of their way to ensure everyone has a great time but the combination of all these items along with the funky beach vibe of Samara make this a truly unique vacation experience. We had four teenagers that actually put down their phones and interacted with the environment and each other during the many activities in which we participated. We did a sunset cruise and were greeted by a pod of 6 humpback whales! This is the fourth year we spent our vacation week in Samara and rented from Mary-Ellen. Each time it just gets better. We will be back next year! The house and location was incredible! The house was perfect for our family and friends. Located up on the hill, it offered spectacular views of the bay and surrounding areas. The house was stocked with amenities and the fully equipped kitchen allowed us to cook fantastic meals at home. Everyone raved about the beds, sheets, bath towels and showers - all wonderful! The pool is a highlight and was well used by our three children who could have played in it all day long. The house is located within a 5 minute drive from the town and made it easy to pop down for groceries, a meal or visit the beach. Samara itself exceeded our expectations and definitely recommend it as a place to visit for travellers to Costa Rica! Finally, the owners, managers and care-takers are exceptional: very trust-worthy, quick response times and friendly. Casa Colibri is a 5 minute drive from two of Costa Rica's very best beaches: Samara and Carrillo. You will find perfect waves for body surfing, boogie boarding, and great waves for beginner and intermediate surfers. You can rent boogie boards for $2/hour, rent bicycles, ride horses on the beach, rent ATV's, kayak through slow-flowing rivers or go ocean-kayaking to the nearby island of Isla Chora, or go diving or deep-sea fishing. Experience world-class zip-lining operated by the fabulous guides at WingNuts. We recommend taking a guided hike through "Samara Trails" with Alvarro, and going ocean-kayaking to the tiny island of Isla Chora. Or go stand-up paddle boarding (during the day or by moonlight) with Chillasana. Kayak slowly through wide rivers and get a great view into the natural jungle off the beaten path. Go snorkeling or diving and see a huge variety of sea life, including colourful fish, turtles, and even lobster. This is a great opportunity to fly in a gyrocopter - great pilot and great rates. Check out Flying Crocodile. Samara and Carrillo are known for having spectacular deep-sea fishing. (home to the President's Cup Championship). You can go deep-sea fishing for BIG fish - sailfish or marlin, or charter a smaller boat and bring home a tuna and mahi-mahi (dorado) for dinner. Either trip you will see dolphins do their fabulous tricks in their natural habitat. Guaranteed, you will not run out of thrilling and thoroughly enjoyable activities, spectacular sights, and memories that will last a lifetime. Discounted rate available for stays longer than 7 nights. Returning Guests receive discounted rates. Small groups receive a discounted rates. Our general cancellation policy: 91+ days in advance, we return 90% Less than 90 days in advance, we return 75% Less than 60 days in advance, we return 50% Ask me, we can be flexible.